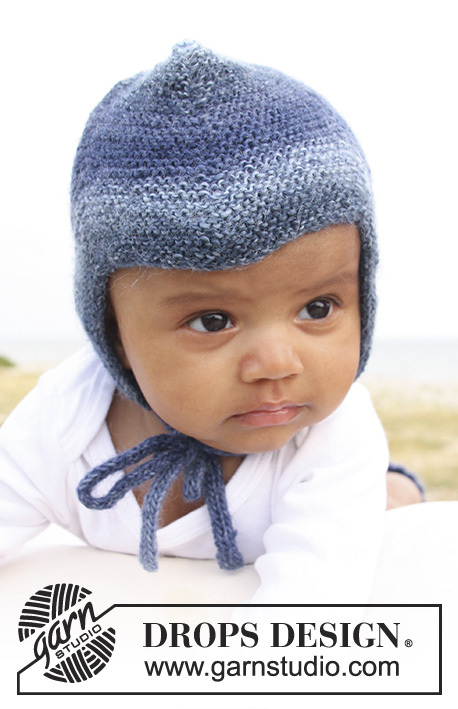 Go to original pattern for design DROPS Baby 20-5. 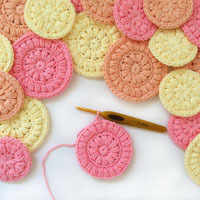 DROPS NEEDLE SIZE 2.5 mm - or size needed to get 26 sts x 52 rows in garter st = 10 x 10 cm. 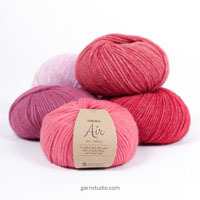 You can get the yarn to make this pattern from	2.30£. Read more. Inc 1 st before and after st with marker by making 1 YO. On next round knit YO twisted (i.e knit in the back loop of YO instead of front) to avoid holes. Dec 1 st on each side of st with marker. Beg 1 st before st with marker. Put 1 st on a cable needle behind the piece, slip 1 st (= st with marker), K next st and st on cable needle tog, psso. 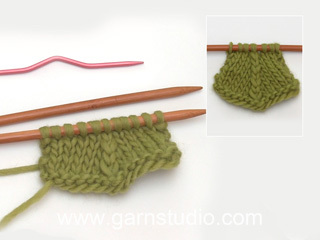 Worked back and forth on needle – K all rows (= garters). Cast on 119-127-135 (139-145) sts on needle size 2.5 mm with Delight. K 6 rows (1st row = RS). 7th marker in the last st on the needle. Continue to K – AT THE SAME TIME on 1st row, beg to inc and dec – SEE INCREASE TIP AND DECREASE TIP! Inc 1 st after 1st marker on every other row. Dec 1 st on each side of the 2nd marker every other row. Inc 1 st before 3rd marker on every other row. Inc 1 st after 3rd marker on every 4th row. Dec 1 st on each side of the 4th marker every 4th row. Inc 1 st before 5th marker on every 4th row. Inc 1 st after 5th marker on every other row. Dec 1 st on each side of the 6th marker every other row. Inc 1 st before 7th marker on every other row. When piece measures 13-15-16 (18-19) cm (measured from bottom tip at 2nd and 6th marker) work next row from RS as follows: * K1, K2 tog *, repeat from *-* WHILE casting off. Back of hat = cast off edge, i.e. 2 whole tips and 2 half tips. The 2nd of the 3 whole tips in the opposite side of the piece = cast on edge, goes down to the forehead at the front. 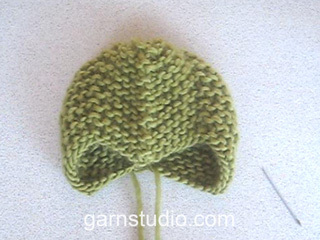 Sew the hat tog edge to edge with 1 stitch in each st along the cast off edge as follows: Sew first half tip tog with first half of first whole tip. Continue to sew second half of first whole tip tog with first half of second whole tip. Then sew the other half of the second whole tip tog with the last half tip. 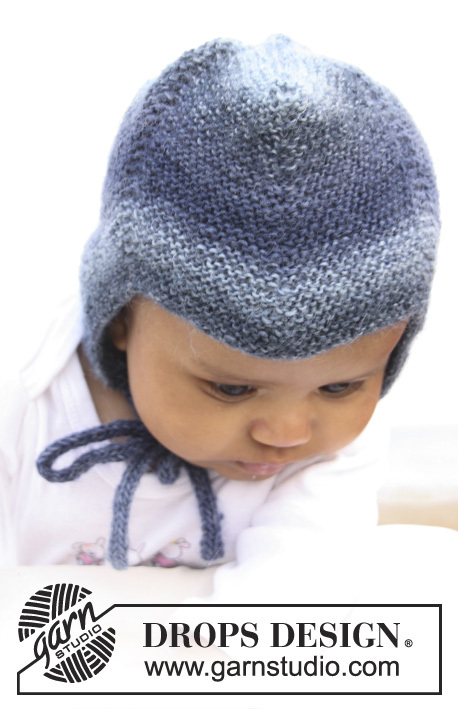 Finish by sewing the hat tog mid back – make sure to sew edge to edge to avoid chunky seams. Cast on 4 sts on needle size 2.5 mm with Delight. 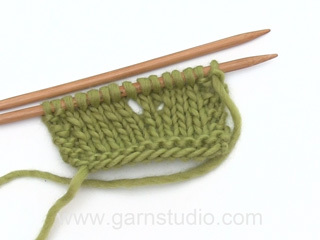 Knit as follows: * K1, place yarn in front of piece (towards you), slip 1 st as if to P, place yarn behind piece (from you) *, repeat from *-* the rest of row and on all rows. 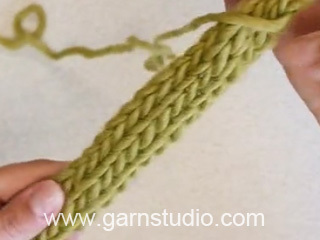 This becomes a string worked in the round. Cast off when the string measures approx. 20-22-24 (26-28) cm. Knit a similar tie string. Sew one tie string at the bottom of each tip on each side. Jeg trenger bedre forklaring på fellingen til slutt. Slik det står kan jeg ikke se at man feller av masker? Jeg vil stadig bli sittende med masker på høyre pinne. Har dere video på denne fellingen? Skal man strikke 6 p ret inden man begynder på ind og udtagning. Håber på et hurtig svar. Hej Kate, Ja du starter med 6 pinde ret. God fornøjelse! Je suis en panne après la bande de 13 cm ( augmentations diminutions) ou et quand fermer les mailles pour le dos du bonnet ? après avoir diminué 1 maille sur 2 combien de fois ? un grand merci de bien vouloir me répondre ! Bonjour Mme Chotard, à 13 cm (1ère taille), on tricote un rang de diminutions (= *1 m end, 2 m ens à l'end* tout le rang) puis on rabat les mailles. On assemble ensuite comme dans la vidéo ci-dessous. Bon tricot! Vedrørende avslutning av arbeidet: Når arb måler 13-15-16 (18-19) cm (målt fra nederste spiss ved 2. eller 6. merke) strikkes neste p slik fra retten: * 1 r, 2 r sammen*, gjenta fra *-* SAMTIDIG som det felles av. Hva mened med "SAMTIDIG som det felles av"? og hvordan gjøres dette i kombinasjon med at *-* skal strikkes. Hej Henriette. Det betyder at du skal strikke beskrivelsen mellem stjernerne (1 r, 2 r sammen) og SAMTIDIG lukker du maskerne af; strik 1 r, 2 r sammen, löft den 1 r over de 2 r sammen, strik 1 r og löft de 2 r sammenstrikkede m over den 1 r osv. Buongiorno Alessandra. Il ferro che sta lavorando è l'ultimo ferro, quello in cui vengono intrecciate le m per la chiusura. Deve quindi : lavorare 1 m dir, 2 m insieme a dir, intrecci (accavalli la prima m del ferro di destra sulla seconda); poi 1 m dir, intrecci, 2 m insieme a dir, intrecci e così via. Ci riscriva se è ancora in difficoltà. Buon lavoro! Buongiorno Alessandra, siamo qui apposta!! Ci scriva ogni volta che ha bisogno! Buon lavoro! Buongiorno Alessandra, gli aumenti vengono fatti nello stesso modo sia prima che dopo il segnapunti, cioè con 1 gettato, ma deve seguire le istruzioni per lavorare. Deve aumentare 1 m dopo il 1° segno ogni 2 f, diminuire 1 m a ogni lato del 2° segno ogni 2 f, aumentare 1 m prima del 3° segno ogni 2 f, aumentare 1 m dopo il 3° segno ogni 4 f...e così via, continui a seguire le spiegazioni. Ci riscriva se non è chiaro. Buon lavoro! Et tips- strikk snorene FØR lua, så får de samme farge som nederste del av lua. Slik som på bildet. Liebe Nicolina, doch das ist berücksichtigt. In der 4. R wird beides durchgeführt.